It will allow you to understand relations among employees to identify emerging groups and cohesive work teams that share objectives. Relationships among employees support the smooth functioning of companies and organization charts do not always reflect how work is conducted. There are internal networks at companies that remain hidden since they are not included in the formal structure. 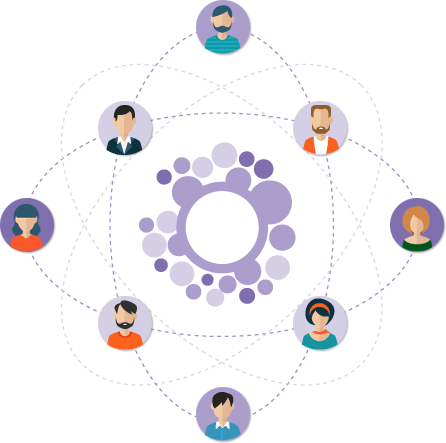 AROS (for Social and Organizational Network Analysis) is a consultancy service from Instituto de Ingeniería del Conocimiento (IIC) to identify, categorise and measure interactions among employees, focusing on those relevant for entrepreneurial processes. This study applies one of the most advanced approaches in organizational analysis: Social Network Analysis (SNA) covers concepts and specific analysis methods to extract valuable information out of these organization maps (detecting spontaneous collaboration and communication groups, identifying hidden talent or discovering areas for improvement on the company). Define objectives and analyse the viability of the project. Inventory and analyse the sources of data available (including privacy and Personal Data Protection aspects). Evaluate the technological requirements of the project. Agree on the results expected, access and presentation. Questionnaires: Employees report their relations and how they are using an online questionnaire. Digital footprint: Digital interactions among employees are collected from any type of channel employed for collaborating: email, corporate social platforms, chat, IP voice, corporate social networks, etc. Using eAROS will be considered, as it provides continuous monitoring and analysis of networks based on the digital footprint. Generation and analysis of networks created by interactions among individuals, which are shown in maps of relationships and studied both analytically and visually to draw conclusions affecting the business. Elaboration and delivery of a consultancy report including the objectives of the study, the results achieved and some recommendations. This information can be reflected in a report or can be accessed through the analytical tool called eAROS. Depending on the results of the study, an action plan will be carried out with the aim of transforming the organization processes and improving the social KPIs. Real-time analysis of Corporate Collaboration Platforms. Improve the internal communication and boost corporate culture at enterprises. Manage the employees’ talent identifying the potential for influence of profiles. Detect hidden experts, leaders and agents of change. Get to know the relationships among employees to identify emerging groups, cohesive work teams and sharing objectives. Define the features of employees affecting collaboration —whether positively or negatively—, and the degree of collaboration among them. 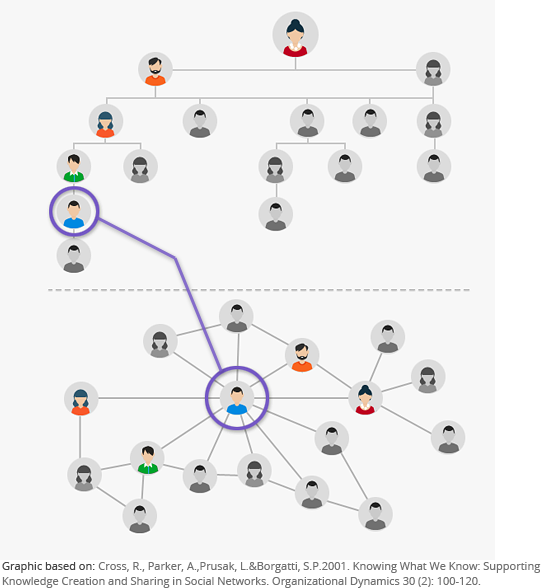 Identify differences between the organizational chart and the social relations detected among employees. Evaluate the impact location of employees may have on the social structure of a company (different premises or geographic location). Diagnose the workflows and identify critical points or “bottlenecks”. This study is performed at IIC by expert researchers of proven track record in social network analysis, advanced statistical methods, prediction models and communication processes. Communication breakdown or lack of communication. Adjustment of values: Entrepreneurial culture and the employee interests should be aligned. Information silos: Knowledge is encapsulated and, then, it is not spread. Commitment of employees: Motivation affects the initiative and participation of the employee. Access to information and people: Communication channels such as email might prevent the access to the company’s knowledge. Accuracy of the analysis. Data of the study will be shown in graphs and social KPIs requiring high calculation speed, advanced databases knowledge and optimization using high efficiency algorithms. More effective processes and productivity increase: According to the McKinsey consultant, 60% of work is doubled because employees do not know what their colleagues are doing. AROS improves the management of collaboration processes that impact directly on work. Reduction of the HR department costs: Making the most of knowledge, reducing brain drain, reducing costs in leaders training, etc. Engagement: Social recognition of the employee and visibility within the organization. Personalization: Adjustment of the solution and service to the client’s needs and the data sources available. Evaluation: Understanding the work relationships shown on the network makes it easier to estimate their contribution in business processes, and therefore, in the return of the investment. The AROS consultancy has been carried out in renowned companies from different sectors: banking, technology and telecommunications. AROS helps to use knowledge, reduce brain drain and costs associated with training leaders, etc.